Whos going to replace the great Warren buffett ? Billionaire Warren Buffett doesn't want to give up the throne at his holding company anytime soon, but the 76-year-old is preparing for that day. Many details remain secret, but the question of who might become Berkshire Hathaway Inc.'s chief investment officer is getting a lot of attention because Buffett said in March he plans to hire one or more candidates for that position soon on a trial basis. Wrapping up this weekend's activities surrounding Berkshire Hathaway's shareholders meeting, Buffett said whoever he hires should expect to be paid based on how well their investments perform. "I would give them a small salary, and then pay them a percentage based on how they outperformed the S&P on a five-year average," Buffett said at a news conference Sunday. Vice Chairman Charlie Munger said that fits with the company's overall compensation plan. "Generally, we want people's compensation tied to what they can control," Munger said. So he said Berkshire's new investment managers won't be paid based on Berkshire's overall value. When he returns to the office Monday, Buffett will encounter the 600 to 700 applications he's already received for that post, and the mail will likely bring more. Buffett said the investment managers he hires won't necessarily be expected to live in Omaha where he and the company's 19-person headquarters are based. "My notion would be to let them live wherever they feel best about life," Buffett said. "Wherever you can think best, the information is readily available." Of the three or four investment managers Buffett plans to hire, he has said one, or maybe two, would eventually become Berkshire's chief investment officer. That's one of the three jobs Buffett is dividing his duties into as part of his succession plan. The only part that has been spelled out is the job of chairman. 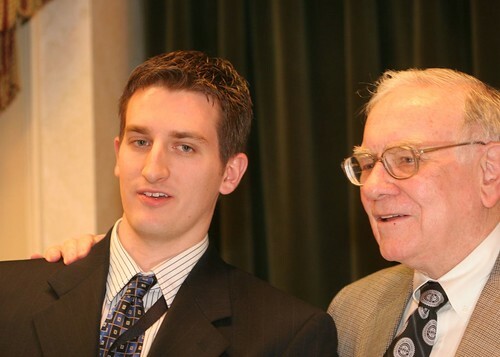 Buffett has said that when he dies, his son will take over the job to ensure Berkshire's culture is preserved. Howard Buffett already serves on the board. Buffe tt said he and the board have already picked three managers of companies Berkshire Hathaway Inc. owns who could succeed him as chief executive tomorrow, if the need arose. "All three of them would be, in many respects, better at it than I am," Buffett said Sunday. "But they don't own 30 percent of the stock, so they'll have to wait." Four Berkshire managers that keep coming up as possible successors are: Ajit Jain, who runs Berkshire's reinsurance division; Tony Nicely, chief executive of Berkshire subsidiary Geico; Richard T. Santulli of NetJets; and David Sokol, CEO of Iowa-based MidAmerican Energy. But Buffett said again Sunday that he still loves what he does and is in good health. "I feel terrific. 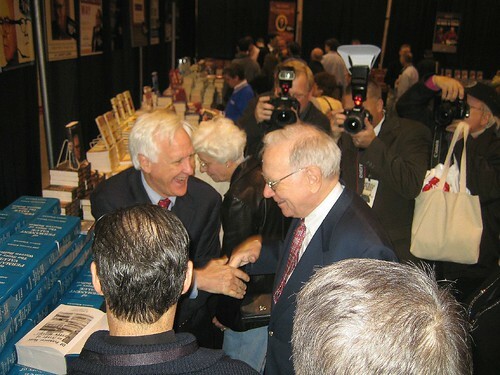 You ought to try this peanut brittle," Buffett said, referring to the box of candy he and Munger kept between them at the news conference. Despite the central role Munger plays in the company, little attention is paid to finding a successor for the 83-year-old vice chairman. But he says that's how it should be. "I do not need to be replaced," Munger said. "If you fade away, you do not need to be replaced." On other topics, Buffett elaborated on Berkshire's surprise move this year to become the biggest shareholder in Burlington Northern Sante Fe Corp. and his company's purchase of stakes in two unnamed North American railroads. Buffett and Munger said they got over their prejudices against railroads and realize the industry has a better competitive position today. Buffett also may have hinted at the identity of one of the two unnamed railroads when answering a question about Canadian businesses he likes. "The guy at Canadian National has done the best job of anybody in the railroad industry," Buffett said. Both Buffett and Munger said the newspaper industry faces serious challenges because the economics of the business are eroding, which could jeopardize the quality of the news. "Now that they're a more threatened enterprise, it will be harder to maintain that integrity," Munger said. Buffett said he believes newspaper ownership may shift from public companies interested in profits to owners driven by motives like public service or ego. But whoever runs newspapers will face long-term challenges, he said. Berkshire draws nearly half of its revenue from insurance and reinsurance businesses, and in 2006 the company benefited from a quiet hurricane season. But Buffett said Berkshire's exposure to hurricanes in 2007 is about half what it was last year because premium prices fell below what Berkshire would accept.